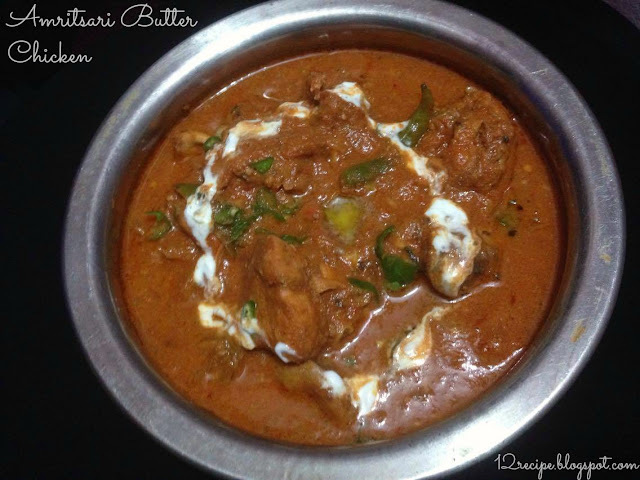 An authentic Punjabi chicken dish having mildly spiced with delicious creamy gravy!! Marinate the chicken pieces with ingredients under marination for about 2-3 hours in fridge. After that heat a pan with 2 tbsp s of butter, add the marinated chicken pieces. Cover cooks it for about 15 minutes (stir occasionally) until half done. Heat pan with another 1 1/2 tbsp s of butter. Add ginger chopped and green chilly. Add tomato puree, and cook for five minutes. Open the lid and add fresh cream, garam masala powder; mix well. check for salt. Add kasoori methi crushed and switch off the flame. Add in to serving bowl and garnish on top with butter, fresh cream, chopped green chillies and coriander leaves.